This version works with OEM ECU and MoTec Equipped Sea-Doo IBR skis. Simply plug our product in between the Buds port and the Buds Cap after removing the IBR Actuator. Some 2011 and older Skis require Custom wiring as the Fuse Box pins are different then the Newer Skis. This is Recommended for Racers Only. Installation of this Product Requires IBR Removal. So Brakes, Forward, Neutral, and trim will NOT function anymore. You are responsible for creating alternative means to make the ski work. This Allows removal of the IBR system without leaving the ski in limited speed mode. The Sea-doo IBR skis ECU looks for signals from the IBR system. If the signals from the IBR tell the ECU everything is working to specs then the ECU allows full throttle. If these signals say everything is not to spec or if the signal is missing the ECU automatically limits throttle and speed. 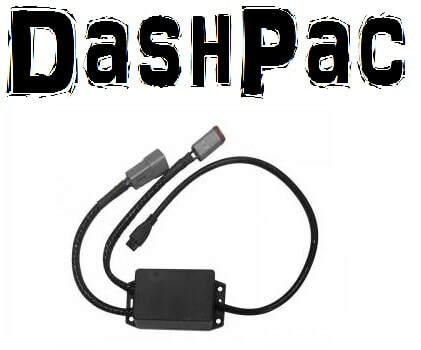 This DashPac product allows Removal of the IBR system and sends the signals to the ECU to allow full throttle. Due to the IBR system controlling important things like Brakes, Forward, Neutral, and trim. This Product is Not Recommended for Anything other than Racers. If you install this system its your Responsibility to Educate all drivers of this ski of the non OEM characteristics of the Ski. By Installing this product you agree to take full Liability for any issues that may arise from Installation of DashPac IBR Delete Kit. Any Use other than Recommended is strictly prohibited.